Caledonian MacBrayne run a ferry from Fionnphort, Isle of Mull, to Iona. See timetable for details. Note that you cannot take your car to Iona without a special permit from Argyll and Bute Council which requires prior arrangement. There is a free car park in Fionnphort where you can leave your car while you are on Iona. 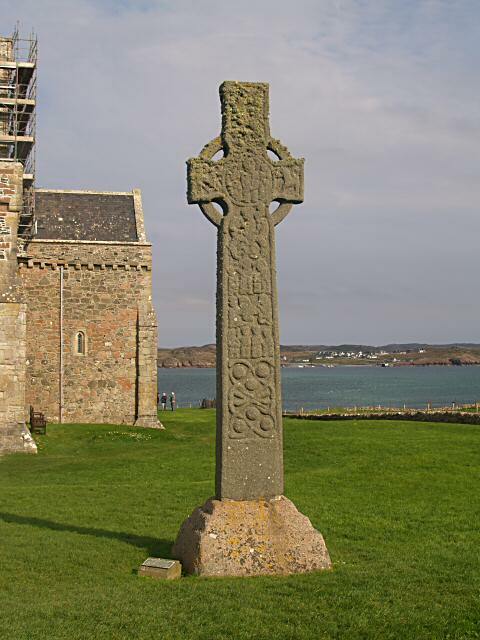 Iona has been a centre of Christian worship for almost 1500 years. 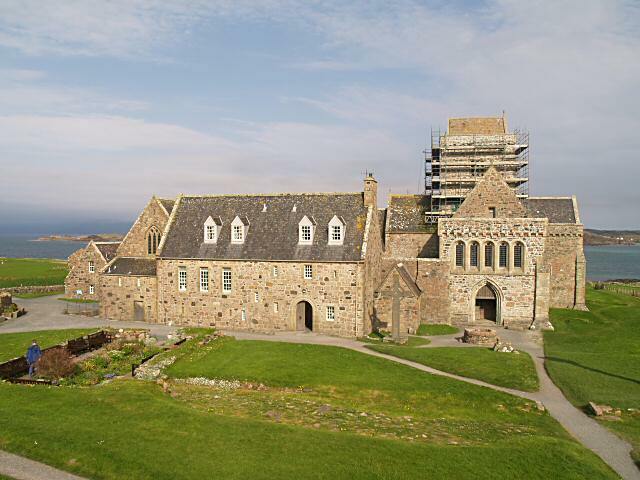 The original monastery was founded by St. Columba, who landed on Iona in AD563, but was destoyed in Viking raids in the ninth and tenth centuries. It was also the burial place of early Scottish Kings. The later thirteenth century abbey lay derelict after the Reformation, and was only restored in the early 20th century. Today the Iona Community continues the Christian tradition. The Abbey building is now administered by Historic Scotland, and there is a charge for tourist entry, but not for services of worship. Iona is also perfect walking country. Climb to the highest point, Dun I (pronounced Dun ee), behind the abbey for a panoramic view of Iona and Mull. On a good day you can also see Tiree and Coll and the lighthouses of Skerryvore and Dubh Heartach. On the west of Iona at Camus Cul an t-Saimh (Bay at the back of the Ocean, pronounced approximately 'Cam-us cool un tav') there is a golf course kept mown by sheep, and the Spouting Cave. 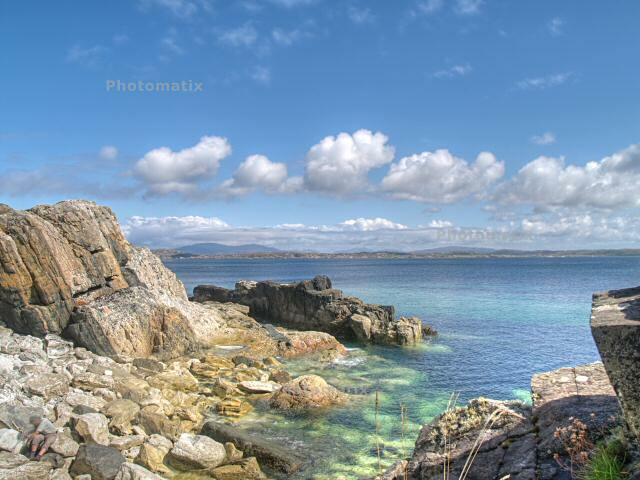 Walk south from the golf course to the southern tip of Iona to see the Marble Quarry (disused) and 'Columba's Bay'. 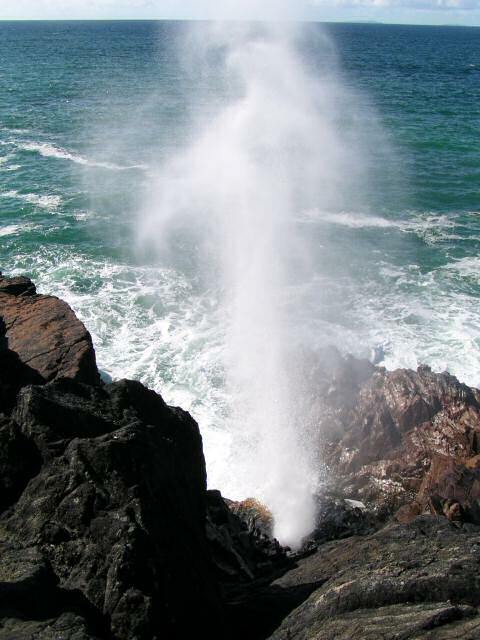 At its best after a strong north-westerly wind and at half tide, the Spouting Cave can be seen from the golf course. It is well worth a closer look for those with the energy. You can safely get quite close, without getting soaked, but it is not recommended for children. According to legend, Columba and his followers first landed at the southern tip of Iona at what is now called 'Columba's Bay'. The original gaelic name was 'Port a Churaich' which means 'Bay of the Coracle'. Columba's coracle is described as being sixty feet long, and covered with hides. Columba, an Irish prince, had gone into self-imposed exile following a bloody incident. He had vowed not to settle anywhere he could still see Ireland, and Iona was the first suitable place he found.